Terence Faherty is the author of The Quiet Woman as well as the Owen Keane and Scott Elliott mystery series. His recent short-story collection Tales of the Star Republic is available from Gisbourne Press. Here he talks about the inspiration behind and the writing of his story “The Hawaii Murder Case” from the January/February 2017 issue of AHMM. My wife and I enjoy traveling, and I thought it would be fun to write a new short story for each place we visited. Instead of forcing a whodunit format on each locale, I decided to let the setting suggest the proper story to tell. For example, St. Simons Island, where we stayed in a creaking old carriage house, seemed like a good place for a ghost story. When we visited Scotland, we encountered the life and legend of Mary Queen of Scots everywhere we went, so I came up with a suspense story that used the famous queen. But I was hoping for more inspiration than just what type of story to write. Years ago, I came across a writer’s block remedy. It consisted of a deck of cards that would randomly generate certain basics of a story, like setting, protagonist, and problem. Trying to weave together those random elements was supposed to stimulate creativity. I never used the card system, but it occurred to me that I could let our trips serve the same role. I began traveling with my notebook at the ready, so I could jot down random elements that I would later weave together in a story. I’m happy to report that the system worked. And it not only served as a creativity stimulus, it made each story a scrapbook of that particular vacation. “The Hawaii Murder Case,” as the title reveals, was inspired by our vacation on Kawai. I came back with the following story elements. 1) During the trip, I was reading a Philo Vance mystery, The Kidnap Murder Case. 2) While we were standing at the edge of a remote waterfall, a branch the size of a suburban tree fell from the forest canopy and narrowly missed us. 3) To access the beach nearest our condo, we had to go up and down a long, steep stairway that was out of sight of anyone not on the stairway itself. 4) On the beach, we observed a May/December couple who barely spoke to one another. 5) Our condo building contained three units, all of which were owned by the same person and decorated identically. From those major elements, and a dozen minor ones, I came up the story of a vacationer who is conked on the head by a falling tree branch and begins to take on the characteristics of the fictional detective he’s been reading about. There follows a sudden death, of course. I made it a comic mystery—told by the “famous” detective’s harried wife—because the crazy premise pointed that way and because I enjoy writing funny stories. They’re a nice break from the grim stuff. 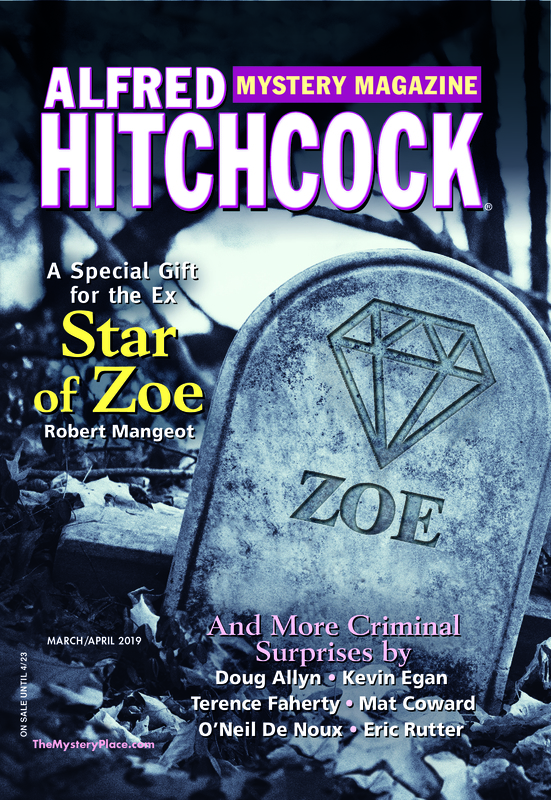 You can check out the results in Alfred Hitchcock’s Mystery Magazine’s January/February double issue. And if you’re ever facing writer’s block, try the random detail remedy. I recommend trying it in Hawaii. Bruce Arthurs is a writer in the mystery, science-fiction, and fantasy genres across several different mediums, including television and, occasionally, poetry. Here he talks about his story “Beks and the Second Note” from the December issue—his first to appear in a mystery-specific publication. I’m not a detective, but that question—Why do people do the things they do?—has been a puzzle my entire life. It’s a common question, one almost everyone asks at some point, or at lots of points, in their lives. Why do good people make bad choices? Why do bad people sometimes make good choices? In the universe inside my head, I’m writing this wonderful script where everyone in the world behaves rationally and understandably; everyone makes sense. In the real world outside my head, everyone keeps ad-libbing. It’s terribly frustrating. Writing fiction is one way I deal with that frustration. In a story, the writer is in control of characters and events and motivations. It can help to make sense of, and deal with, real life. “Beks and the Second Note” arose from a stew of news items from recent years: police shootings of black men; economic hardship and homelessness; the increasing presence of surveillance technology; the legalization of concealed carry in many states and the myth of the Good Guy With A Gun. All this simmered in the back of my mind for months until that “Ah-ha!” moment when the potential for a story fell into place. And the oddly-named Bok Beks seemed the right character to tell that story. It’s not his first appearance; Bok first appeared over a decade ago in a very-small-press chapbook-sized anthology of stories about radioactive monkeys. (Yes, really. Small press can get very weird.) He has a pretty extensive backstory in my head, and I’m hoping future work will occasionally return to reveal more of Bok’s own story and the choices he’s made. But that probably involves a lot more simmering on my brain’s back burner. My scattershot bibliography has mostly been in the science fiction and fantasy genres, a reflection of my primary reading over the years. The first book I remember reading, at age six, was Todd Ruthven’s Space Cat. But mystery and detective fiction has always been a close second (the Encyclopedia Brown stories are another memory of early reading), and almost every story I’ve written has fallen into one genre or the other. And occasionally, as with “Clues,” the episode I wrote for Star Trek: The Next Generation, something falls solidly into both genres. But I’m pleased as Punch to break into Alfred Hitchcock’s with “Beks and the Second Note.” It’s my first sale to a specifically-mystery market, and it’s especially satisfying to make it to one of the most important markets for short mystery fiction.